Even if drivers complete point reduction classes, they must still pay the assessment fee in full. The assessment for drug and alcohol related offenses is $250 a year, totaling $750 over the course of 3 years. A New York traffic lawyer can help drivers avoid the assessment and protect their finances and driving record. Attorney Michael Block has more than 25 years experience fighting traffic violation tickets and achieving positive outcomes for his clients. When you receive a New York traffic ticket and would like to keep your insurance premiums as low as possible, as well as maintain your driving privileges, please contact our office at 212-227-9008 for a free consultation. Pedestrian Safety is a Two Way Street! New York City is known for its crowded sidewalks and city streets. Between tourists trying to navigate the Big Apple and residents hurrying to their destinations there will always be an abundance of pedestrians. A lot of people opt to walk, rather than drive or take public transportation, especially if they’re going into a crowded hotspot in Manhattan like the Theater District. Nestled in the heart of the City and next to Times Square there are always hundreds of people rushing to catch a Broadway show. Whether coming above ground from the subway, hopping out of a cab or just walking, there are usually pedestrians everywhere. With the constant flow of pedestrian traffic comes the issue of pedestrian safety. According to Mayor DeBlasio in 2015 there were 133 pedestrians killed in traffic crashes. Just a year ago a man was pinned beneath an SUV while walking through the Theater District on West 42nd street and died shortly after. Mayor DeBlasio’s Vision Zero plan reported that Manhattan’s pedestrian fatalities and severe injuries are most heavily concentrated below 59th street. It also listed priority intersections in Manhattan that pedestrians and drivers should be mindful of. Seven of those intersections are in the theater district. Drivers in New York City need to be more aware of pedestrians, especially in these crowded intersections that attract tourists. 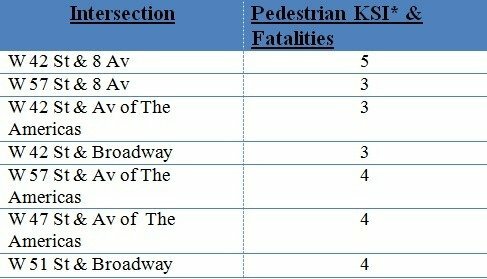 *According to Mayor DeBlasio’s Vision Zero, KSI stands for killed or seriously injured when the Government is referring to road safety. A pedestrian is considered killed when they die within 30 days of a crash. A death is considered a fatality when the pedestrian dies within 24 hours of the crash. 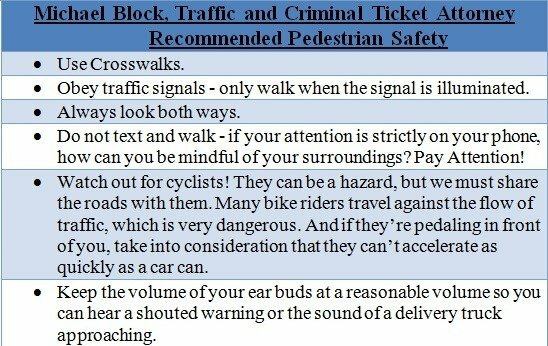 Not only do these tips keep pedestrians safe and help avoid accidents but they also can keep you out of traffic court! Tickets for Failure to yield, texting, talking on the cell phone, wearing ear buds, speeding, disobeying red lights and traffic control devices are NYC traffic violations that can all lead to summonses which carry points and fines.